As the government shutdown continues to drag on, the effects are starting to be felt by the 420,000 federal employees working without pay and the 380,000 federal employees who have been furloughed. Thousands of federal employees missed their first paycheck of 2019. Just as significant, janitors,security guards, and other federal contractors will receive no back pay from their missed work. Florida is among the top 15 states most affected by the government shutdown. Approximately 140,000 federal employees, not including contractors, are being impacted in our state. As the days without pay loom over the heads of federal employees, a critical community resource is available. Our 2-1-1 Information and Referral Crisisline can help connect you with food pantries, utility assistance and eviction prevention assistance. 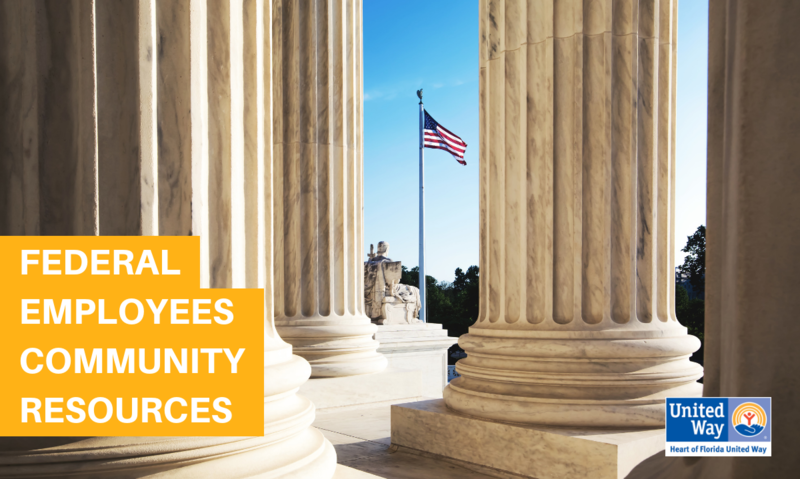 If you are a furloughed federal employee or government contractor in need of social services or an individuals with questions about the availability of public benefits, you can contact 2-1-1. To connect, simply dial 2-1-1 or you can text your zip code to 898-211. Additionally, you can chat with a 2-1-1 Specialist by visiting www.HFUW.org/GetHelp. In addition,there are specific resources available due to the government shutdown. Click here for more information and a list of financial relief and support from companies. The 2-1-1 Crisisline is available 24/7/365. A 2-1-1 Specialist can also provide information about mental health counseling, transportation, job training,substance use recovery services, child care and volunteer opportunities. It is a free, confidential referral and information service that helps individuals find local health and human services. Additional information about unemployment benefits for furloughed employees is available from the United States Office of Personnel Management. Click here for the OPM furlough guidance page. Based on the 2017 ALICE Report (Asset Limited, Income Constrained, Employed) more than 40% of American adults don’t have enough savings to cover a $400 emergency.This is especially concerning due to the adverse effects that could occur should federal government programs be reduced or halted. As the federal government shutdown continues, the impact on employees and their families across the country will become more dire. Heart of Florida United Way will continue to serve our community by offering resources and support. Help us spread the word about these valuable community resources on your social media channels!